Why should my organization share this with our plan members? 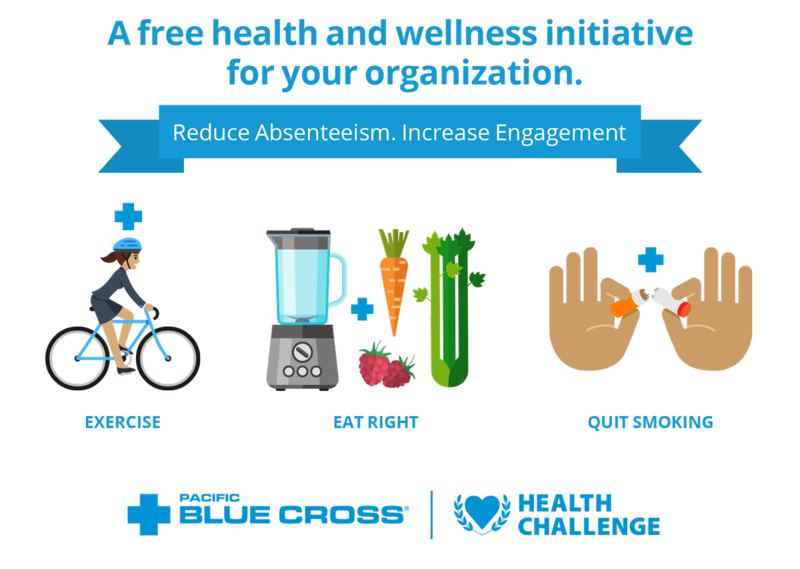 The Pacific Blue Cross Health Challenge is a positive way to educate your members about healthy habits such as eating nutritiously, quitting smoking and getting more exercise. It can help you to engage members in supporting each other’s health goals and promoting a healthier workforce. Is there any cost for our organization to participate? The contest is free for all Pacific Blue Cross plans and is open to all of your employees. Do plan sponsors have to do any administration for the contest? No. This contest is being run by Pacific Blue Cross to help British Columbians enjoy a healthy 2019. It does not require any administration from plan sponsors and we provide you with promotional materials for your workplace below. How does the Health Cash work? Pacific Blue Cross will reimburse Health Cash winners up to $2,019 for products or services tied to improving their health, like gym memberships, new bikes or a smoothie makers, for example. Winners send their receipts directly to us and we pay the full amount. Does this affect a member’s benefits? No, the health cash is completely separate from a member’s health plan coverage and limits. If you would like co-branded posters please email your logo to healthchallenge@pac.bluecross.ca. Display these posters in common areas to encourage people to take the challenge. Download this Rich Text File (RTF). You can open the file with your preferred editing software (MS Word, Wordpad) and cut-and-paste the content into a new email message for your members. Embed the HTML code and display the Health Resolution Challenge badge on your website. Use this video in your employee intranet or TV displays. Copy the code below to place on your website. Copyright © 2019 PBC Health Benefits Society. All rights reserved.